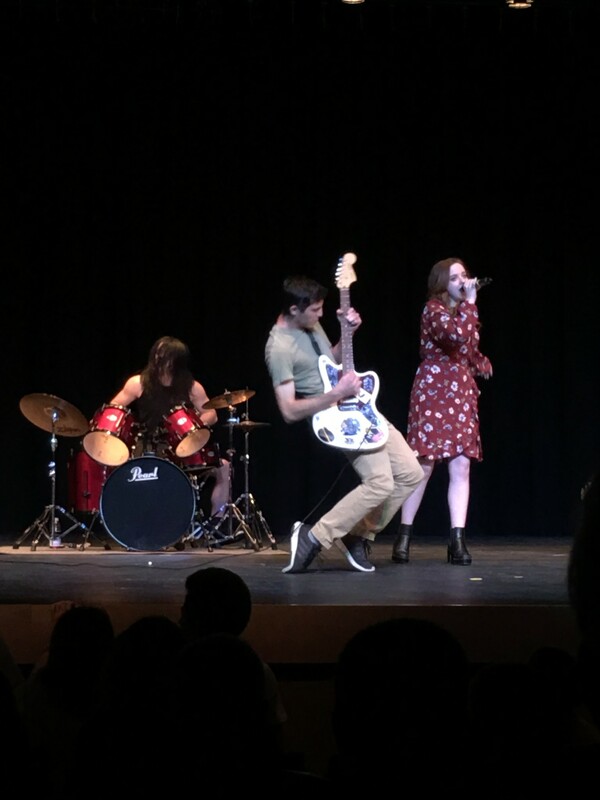 In preparation for the annual showcase of talent at Littleton High School, many wanted to encourage the attendance of those that found themselves unfamiliar with the event and its acts. “As the person who sat through all of the auditions and put the show together, I think that we have created an amazing show for everyone this year,” said junior class president Makayla Franklin. This show had been in the making for approximately a month. The preparation included the development of class skits, sound checks, rehearsals for the talents and more. “You should definitely come because it’s going to be funny. I know we have a comedian coming in so I think that’s going to be super cool, and we have a lot of talented people performing, a lot of singers. Of course, the class skits are going to be fun, so definitely do come because I think it’ll be worth it” said senior and senior skit participant Alex Ortiz. The shows were on the 8th and 9th of November at 7pm in the Mane Stage Auditorium. Many recommendations for the show were made and the school buzzed of excitement for the upcoming surprises. With the excitement, alumni attendance was high. Both Thursday and Friday’s performances included the same acts, but varied surprises throughout. Thursday captivated the high schoolers, presenting a comedian who cracked some laughs early in the show. Many of the acts found themselves nervous. Though they were nervous, they pushed through their fears and delivered a performance that would give the people the show they were eager for. “I was really nervous, but after being on for a minute I felt more comfortable and was able to do me,” said freshman Cadence Adams. Adams began her performance of the night, impressing the crowd because of her youth. The moment she opened her mouth to sing and her song began, the crowd was even more amazed. Performing “One Day” by Tate Mcrae, all the auditorium loved her courage and ability of her voice. On Friday, everyone took their seats in the auditorium while anxiously waiting for the show to start. Many had not been to Thursday’s show and the performers had grown more comfortable with the stage. Freshmen Grace Amine and Nevaeh Brown performed a violin-cello duet to the song “Secrets” by OneRepublic. The audience was delighted by their ability to work together and make a great performance out of it. “My experience in the show was great, I liked being able to connect with other people in the show and it really gave me an opportunity to do something I liked. I would be in the show again because it was one of the best things I’ve done in a really long time,” said Amine. Afterward, Jurnee surprised the audience as the special guest of the show. She performed at Follies on Friday, but to do so she flew from Los Angeles, California to sing “Almost is Never Enough” by Ariana Grande. Jurnee attended Littleton High School and was a former competitor on American Idol. Her confidence and ability to engage the people watching was incredible. Switching the mood of the night, LHS traditions emerged. The senior skit, traditionally made to “roast” the teachers at LHS, didn’t fail to give the audience a good laugh. As Ben Greenly walked on stage in high heels portraying Dr. Oaks, two sides of this story unfolded. One side was the year 2118, where the LHS teachers resided in a retirement home, and the other side in the year 2018 where they were impatiently waiting for Dr. Oaks to arrive at a meeting. 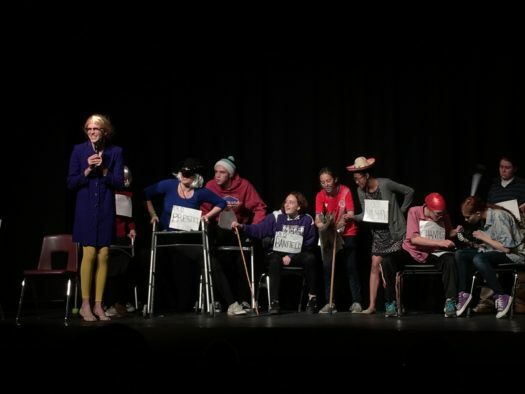 The seniors didn’t fail to mention the 80 countries Kathy Prestel has visited or Mr. Chandler’s statistics, and the whole skit left the audience shocked at the senior’s acting skills. The junior skit was a rap, roasting all the other classes at LHS. Both alumni and current students were surprised at how good the verses were, leaving all the other classes speechless. “I will definitely plan to be in Lion’s Follies again, I’m excited for senior year next year with the senior skit and possibly being an MC,” said junior Ellery Tripp, who acted in the junior skit. The band, Little Birdie performed “Wet Sand”, leaving fans begging for an encore. Both nights students ran to the floor near the stage to cheer them on. With a great show put on this Fall, Littleton High School can’t wait for next year’s show. Safe to say that the 2018 Lion’s Follies was well made and left the crowd excited for 2019’s acts.